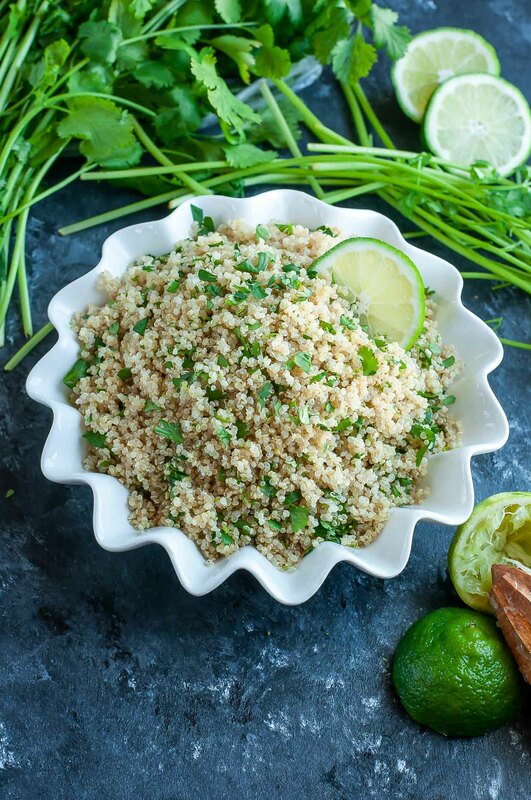 Get your fiesta on with this zesty cilantro lime quinoa. Gloriously gluten-free, vegan, and just plain delicious! Makes a great side dish or burrito bowl base. Today’s post is going to be a bit of a quickie, just like this recipe! Everyone needs an arsenal of fast, easy, and healthy side dishes so get ready to toss this one into the weekly line-up. 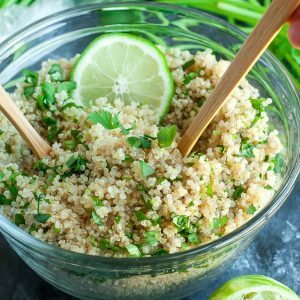 With the refreshing flavors of cilantro and lime, this fluffy quinoa will compliment a bevvy of dishes and knock your typical pot-o-rice out of the water when taco night rolls around. I’m already dreamingup a behemoth burrito bowl with this sassy quinoa as the base. YUM! 3 cups of fluffy quinoa fit for a fiesta! Need a little less? Feel free to halve the recipe! Feeding a crowd? You can easily double or triple as needed with no additional work. SCORE! Just grab a large enough pot and you’re good to go! Leftovers taste great and can chill in your fridge for up to 4 days. So… what are you waiting for? 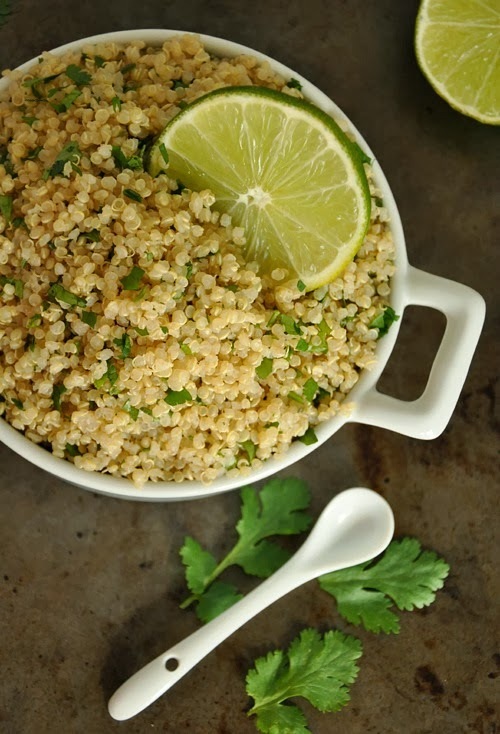 Let’s get our cilantro lime quinoa on! 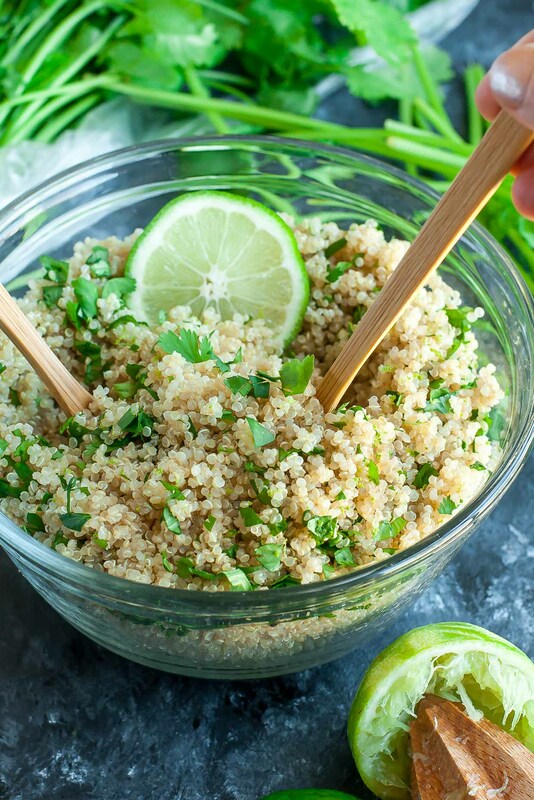 Get your fiesta on with this zesty cilantro lime quinoa. Each bowl is gloriously gluten-free, vegan, and just plain delicious as side dish, salad topper, or burrito bowl base. Add chopped cilantro, lime juice, lime zest and oil and season with a pinch of salt and pepper. Toss to combine and taste. Add any extra cilantro, lime, or seasoning that your heart desires and dig in! Leftovers taste great and can be stored in the fridge for up to four days. The quinoa will soak up the lime and oil so, to amp up the flavor, add a little extra dressing the next day and you're good to go! A scoop or two makes a fabulous salad topper or a flavor-filled base for a yummy burrito bowl! I seriously can't get enough of this stuff! Craving intense citrus flavor? Add the juice and zest of the entire lime! Serve it hot or chilled (my favorite!) 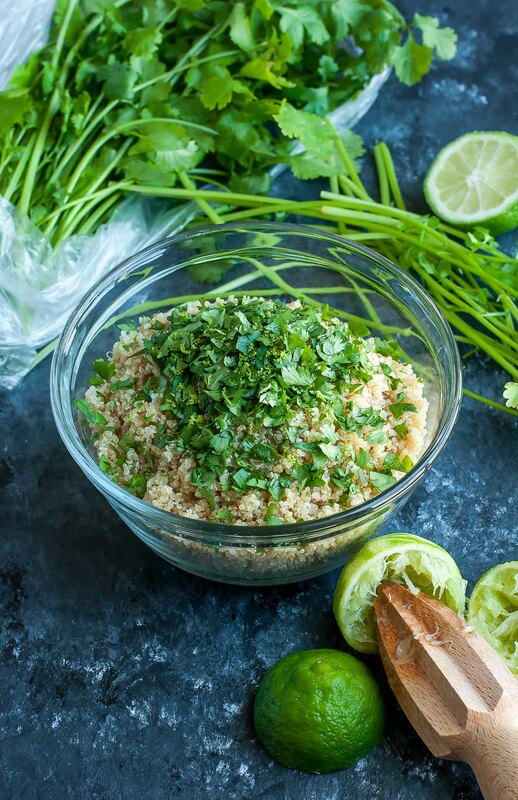 but whatever you do… get this citrus-flecked cilantro lime quinoa your face, stat! Making stuffed peppers? Taco-fy your filling and use cilantro lime quinoa in place of the rice. Easy peasy lemon lime squeezy! You can even try them in these Baked Bell Pepper Tacos! Get your carnivore on by serving it up with grilled chicken and peppers or keep things vegan by topping your quinoa with these taco roasted chickpeas. Have fun with it and feel free to share a photo of your creation! I can never have enough side dish recipes ! 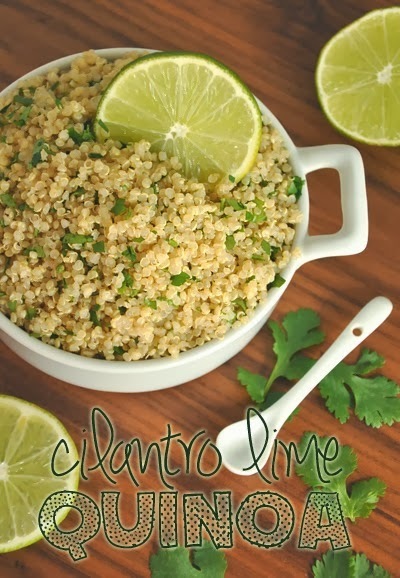 Love your Cilantro Lime Quinoa and will be adding the recipe to our menu ! I love this quinoa salad with all of that yummy fresh lime. Can’t wait to try this out at our next cookout! I just made this recipe and I add some nutmeg and avocado AMAZING !!! I made this for my in laws and my family this past weekend….SMASH HIT!!! Thank you for this recipe! So glad you loved it! The roasted corn is brilliant!!! I’ve only ever added straight-from-the-freezer sweet corn to it but roasted sounds purely dreamy! I’ll try that! Thanks! Omgosh this looks delicious!!! I am going to get the ingredients and make this today!! Thanks for sharing!! I just did this same combo with brown rice. Genius idea to use quinoa. I might have tried that, except I made four cups of dry rice for a recipe that calls for 4 cups of cooked rice. Oops, I ended up with 12 cups of cooked rice. Ha, ha. Oh well, it all went into delicious things…cilantro lime rice included. oh my… this looks amazing! Totally making this over the weekend! Yum yum yum yum yum yum yum yummmmmm! Sweet! I seriously love cilantro lime RICE, I’m not sure why I haven’t thought to do it with quinoa. You are the twistomexicanerrything goddes I’m sure of it. this sounds so good! would be perfect for a mexican burrito bowl. This looks so good! I feel the urge to run right to the store and make it tonight! Yum! I’m going to make this alongside some Siracha wings for Superbowl! This looks wonderful, I adore cilantro but have not been using it much lately for some reason. Adding it to my list, thanks! Reminds me of good old Chipotle which is one of my favorite foods to recreate at home. This sounds like a perfect, quick side dish! This looks so good! I have made homemade Chipotle bowls at home and created a similar recipe to this one for it! Cilantro and like is so so good! Cilantro+lime for the win!! Love this. Wow Jenn this looks gorgeous! Love the sound of the flavours with the quinoa – lime, coconut and coriander (as we UK folk call it) are such a winning combo.